We have found a winner! 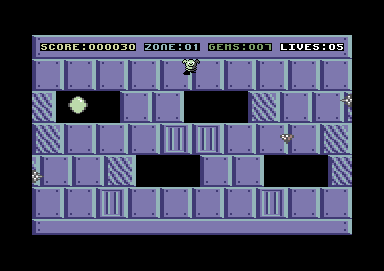 The New Dimension and Cronosoft has launched a new compo for you C64 fans out there. 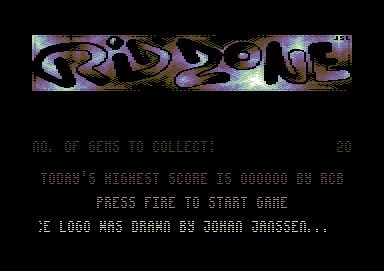 After the success of the Higgledy Piggledy compo for the Spectrum, TND & Cronosoft have both agreed to set up a competition where you can win "Grid Zone" and also Cronosoft's latest C64 addition "Grid Zone Remix". 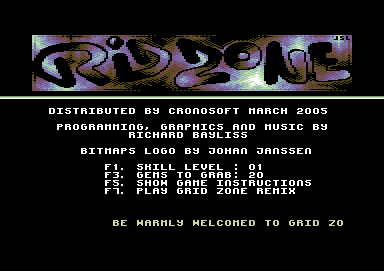 What is Grid Zone Remix? 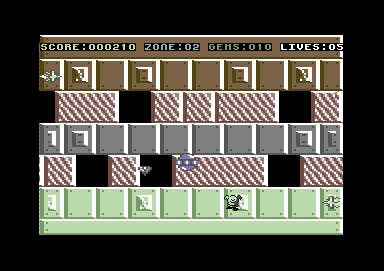 Grid Zone Remix is a sequel to the original Grid Zone game, for the Commodore C64/128 and more enhanced, hence the same kind of story line, but you'll spot the differences anyhow. Grid Zone Remix has more abilities compared to the original "Grid Zone" game. 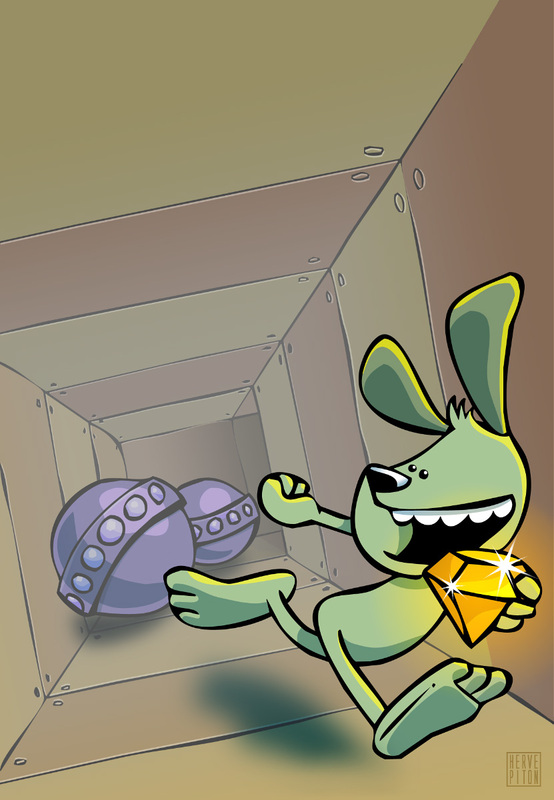 It features up to 16 levels of madcap mayhem, where you guide Ned the Dog around each arena of the Evil Taxxonian's Grid Zone, collecting gems. One problem though. Each zone is heavily guarded by a cyberdroid guard, and also two hover-lazer cannons. Ned must take a safe path across each zone, collecting enough gems, so that he can proceed on to the next level, and so on. However, he has to avoid contact with those nasty enemies, and avoid falling through the black holes. After each level is complete, you recieve a bonus score. The higher the skill level you choose, the more points you gain. So, can you help Ned defeat reach the exit of the deadly Grid Zone, before it is too late? 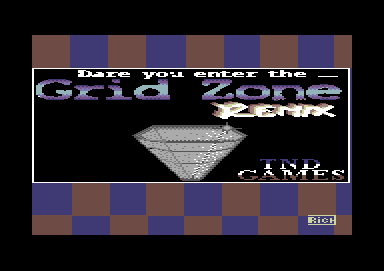 What's the difference between Grid Zone and Grid Zone Remix? 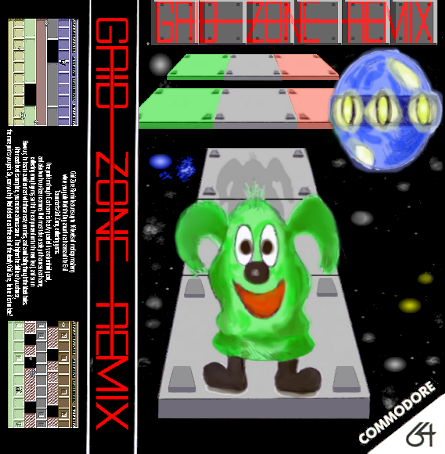 There are some similarities to the original Grid Zone and GZ Remix, but there are also differences. 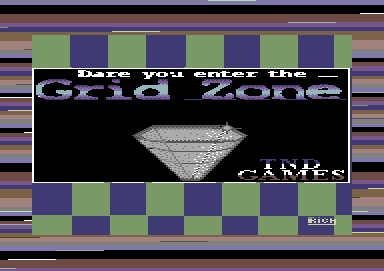 Grid Zone consists of only 8 levels and Grid Zone Remix consist of twice the no. of levels. 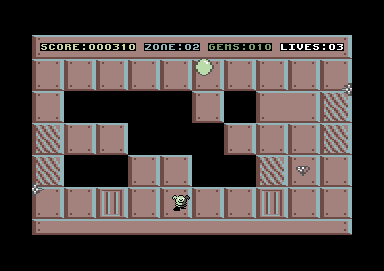 Grid Zone hardly has any proper animations with enemy sprites, and the graphics sprites are quite ugly. GZ remix consists of more colours and nicely animated sprites. The scroll system in the original Grid Zone was very rough, but GZ Remix has a more smoother and nicer scroll for the main game. Making Grid Zone Remix more appealing. There are also a variety in attack waves, nicer presentation, etc and a better end sequence too. The tape version of this game uses a nice loading system, which plays music and displays a loading picture (Freeload V5). Now let us take a look at the screenshots of both of those games. The result of the compo will be judged, by using a voting poll. Voting commences 24th July 2005! Sorry, but the closing date has expired. Many thanks go to all those of you who entered this compo.